ESTES PARK, Colo. – Justin Rumford has always made people laugh. It’s his naturally gregarious nature, a personality developed from a life on the rodeo trail. He’s a third-generation cowboy who has done just about everything there can be done in the sport he loves. Rumford was raised in a south Kansas rodeo family and has served as a truck driver, a pickup man, a bullfighter and a contestant, just to name a few. He spent his young adult life trying to find his perfect fit in the rodeo industry. He found it about five years ago when he combined his rodeo experience with his personality and became the preeminent clowns in ProRodeo. In fact, he’s been named the Professional Rodeo Cowboys Association Clown of the Year each of the past four seasons and is a two-time Coors Man in the Can. He will have it all with him to the 90th edition of the Rooftop Rodeo, set for 7:30 p.m. Wednesday, July 6-Monday, July 11, at Granny May Arena in Estes Park. 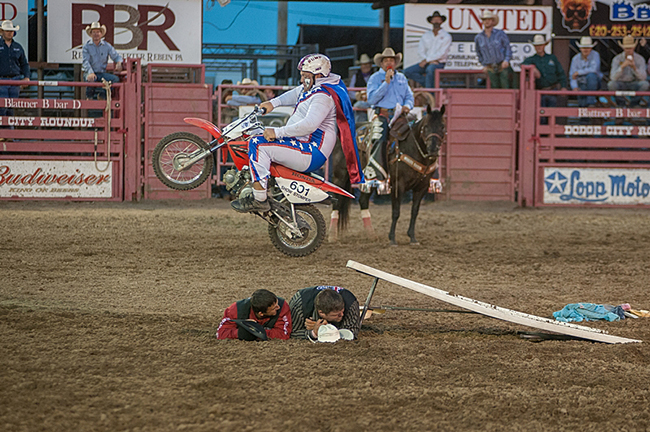 Rumford will be the rodeo’s clown and featured act for the six-night rodeo. “We have had Justin and his family at Rooftop Rodeo before, and we’re very excited to have him back this year,” said Mark Purdy, chairman of Estes Park Western Heritage Inc., a group of volunteers that works with the town of Estes Park to produce the annual rodeo. Comedy is at the forefront of Rumford’s repertoire, and he adds a distinct flavor to each rodeo performance. Having a lifelong history in the game also plays to his strengths. He’s had great success in just a short time as a rodeo clown, but his biggest reward is doing something he loves. Still, he doubled-up in two major awards this last year, being named the Clown of the Year for the fourth straight time and the Coors Man in the Can for the second time in three years – the latter award is named for the best barrelman in the sport. He’s made it, and now he’s bringing his show back to Estes Park.